The boys varsity basketball team lost a heartbreaker Friday night to the Merkel Badgers 42-39. The two District 5-3A rivals played a long, hard and physically aggressive game all four quarters. 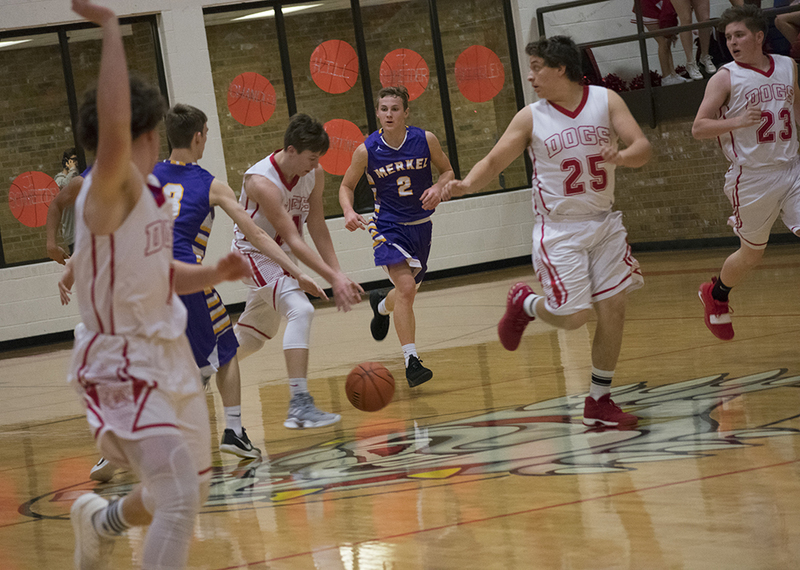 For most of the game, the Badgers had the upper hand while the Bulldogs fought hard to stay within reach. By the third quarter, Coahoma was down by 7 points. Then Gage Clark-Burdell hit two field goals in a row and was fouled on the second. Converting the extra point, Clark-Burdell’s free throw brought the Bulldogs within two points to tie. And Joe Manning did just that. Stepping up to the charity stripe and in front of a very noisy crowd, Manning nailed his two shots to knot the game 24-24. However, the Badgers went on another scoring spree to end the quarter up seven points, 34-27. 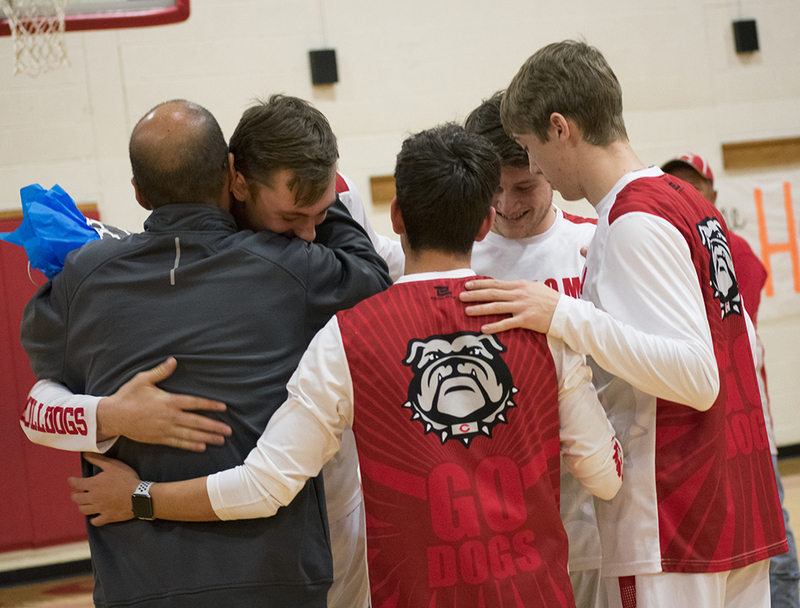 With a little more than 2 minutes left, the Bulldogs clawed their way to within 3 points of forcing the game into overtime when Clark-Burdell sank a ball in for two and Bryson Cline nailed his second three-pointer of the night. It was an all-out scramble for the keeping control of the ball from then on. Coahoma fouled a Merkel player with 9 seconds left in the game. As the Badger stepped up for his first 1 and 1 free throw, it looked as if Merkel had secured the game. He missed. Clark-Burdell came up with the ball and headed down court lightening fast. With the game clock about to expire, he passed the ball to Cline who got off the three-point attempt as the buzzer sounded. The shot just barely missed. Clark-Burdell had a game high of 18 points for the Bulldogs and Cline added 10 more. Next: Coahoma heads to Clyde to take on the Bulldogs at 6:30 p.m. Tuesday. Merkel — Tryce Pape 16, Tyler White-O’Neal 11, Slate Stone 15. Coahoma — Joe Manning 4, Zack Schneider 7, Bryson Cline 10, Gage Clark-Burdell 18. Free Throws — Coahoma 4-7, Merkel 4-11; Three-Point Goals — Merkel 4 (Pape), Coahoma 3 (Cline 2, Clark-Burdell); Total Team Fouls — Merkel 12, Coahoma 19. Coahoma — The Coahoma JV Bulldog team lost to the Merkel Badgers after an impressive fourth quarter surge to come within one point of tying the game. With .9 seconds left on the game clock, Isaiah Martin grabbed an inbound pass and shot for the net. The ball bounced off the rim and went wide. Martin and fellow teammate Garrett Anderson both brought in 6 points each for the Bulldogs. Next: The JV team heads to Clyde to take on the Bulldogs for the last game of the junior varsity season. Merkel — Jackson 7, Carey 6, Sebastian 2, Russell 10, Shubert 3, Johnson 2. Coahoma —Avery Burgans 3 , Isaiah Martin 6, Collin Daniels 4, Noah Dials 4, Logan Servance 2, A.J. Gutierrez 2, Isaac Murillo 2, Garrett Anderson 6. Free Throws — Merkel 2-3, Coahoma 5-9; Three-Point Goals — Merkel 4 (Russell 2, Jackson, Shubert); Total Team Fouls — Merkel 10, Coahoma 7.